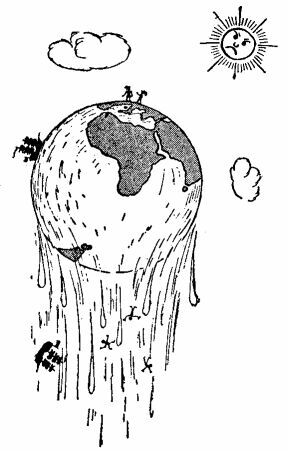 Image via Donald Simanek's site on flat earth beliefs, credited to George Gamow. That comparison is actually quite instructive. Bob Schadewald’s Worlds of their Own and Christine Garwood’s Flat Earth: The History of an Infamous Idea survey a lot of this history in great detail; Schadewald, a past board president of NCSE, was close friends with International Flat Earth Research Society of America founder Charles Johnson, and was offered IFERSA’s presidency in the event of Johnson’s death (he declined, citing ethical concerns given his lack of belief in a flat Earth). And what inspired Rowbotham’s public crusade? “Evidently an ingenious character, who delighted in controversy and dispute, he could not resist the ultimate challenge of toppling orthodox ideas and a fact so established as the earth’s rotundity…he had seen the passions that scientific and religious topics could evoke and, moreover, the money that people would pay to listen to a feisty debate on these themes.” His 20th-century intellectual heirs shared the religious fervor that Rowbotham drew on in his writings. They had the advantage of being able to tap into the existing creationist milieu, and a large body of people who had committed themselves to the idea that a tortured reading of the Bible was a preferable source of information about the world than empirical evidence. They created their own newsletters and journals. Was Secretary Kerry fair in drawing a parallel between the climate change denial movement and groups like Johnson’s? I’d say so. Decades after humanity’s role in causing climate change was well-established, they continue concocting fanciful reasons to reject that science. They purport to be skeptics, and create Potemkin journals and conferences to create a semblance of scientific rigor, yet focus their efforts on political and cultural agendas, not on engaging with real science. Just as the flat-earthers piggybacked on the work of creationist groups, climate change deniers could draw on anti-science attitudes stirred up by the tobacco industry, and by a host of industry-funded anti-environmental campaigns. In the end, the key issue with science denials is how useful the ideas are. Evolution gives us medicine, old Earth geology helps us find coal seams and drill oil wells, globes let us plan travel efficiently and explore the stars, and climate science lets us understand, anticipate, and prepare for imminent dangers. Denying each of those sciences cuts us from those benefits. Now, President Obama and I believe very deeply that we do not have time for a meeting anywhere of the Flat Earth Society. One of the arguments that we do hear is that it’s going to be too expensive to be able to address climate change. I have to tell you, that assertion could not be less grounded in fact. In fact, it’s exactly the opposite. Serious analysts understand that the costs of doing nothing far outweigh the costs of investing in solutions now. You do not need a degree in economics or a graduate degree in business in order to understand that the cost of flooding, the cost of drought, the cost of famine, the cost of health care, the cost of addressing this challenge is simply far less – the costs of addressing this challenge are far less than the costs of doing nothing. Just look at the most recent analysis done by the World Bank, which estimates that by 2050, losses from flood damage in Asian ports–fishing ports, shipping ports–the losses in those ports alone could exceed $1 trillion annually unless we make big changes to the infrastructure of those ports. This point is, if anything, even more urgent in schools. Today’s school children will be confronting the consequences of climate change for their entire lives. Even if we instantly switched the entire world economy to carbon-neutral energy sources, the inertia of the climate system means that a high school student today would live in a climate shaped by past emissions until well into her retirement. For our children to navigate this changed world, and make the critical decisions they’ll have to make, they need accurate information about what climate change is and how it’s playing out. Allowing climate change denial into their classrooms, or omitting climate change instruction, holds them back from being able to take part in those crucial decisions, just as surely as it would hold them back to take globes out of their classrooms.